At SidewalkGuides, we're always looking for new ideas that bring D.C.'s past to life. A new blog caught our attention that you might find as interesting as we did, at http://quondamwashington.blogspot.com/. More than 10 years after the idea was first hatched, the U.S. Capitol visitors center opened late last year. It was supposed to be completed in time for President Bush's second inaugural, but that date came and went. The massive 580,000 square foot (that is not a misprint) underground center is the largest addition to the Capitol since the Civil War. Inside, visitors can find exhibits on the history of the Capitol building and the legislative branch of government. The primary purposes of the center are to accomodate the larger crowds coming to the Capitol and maintain security. Officials wanted an underground center to keep as close as possible to landscape architect Frederick Law Olmstead's original 1876 plan for the Capitol's East Front. The East Front was historically the location for Inaugural Addresses, including Lincoln's second inaugural address, with John Wilkes Booth in the audience. Our Civil War Tour discusses this historic address and much more. Now, tourists seeking a Capitol tour can book tickets online. While it's been a little while since we went on one, we recall them being first-rate. SidewalkGuides' great content is coming to the iPhone! Our partners at GoTourIt have developed a fantastic application that will feature our audio tours and a lot more we've researched for you, including video, GPS coordinates, weblinks and more information about every stop. We'll post again as we get a firm date for the launch. Celebrate Lincoln's 200th birthday at Lincoln Cottage in Washington, D.C.
As 2009 begins, you'll no doubt hear quite a lot about the 200th birthday of Abraham Lincoln. The year began with President Obama taking the oath of office (the first time) on the same Bible used by Lincoln in 1861. Ford's Theater, where Lincoln saw Our American Cousin the last night of his life, will reopen after a major renovation to celebrate his 200th birthday. 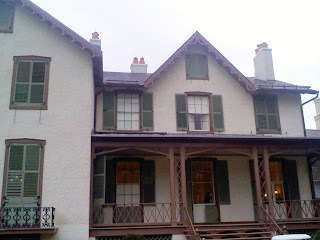 But also consider seeing Lincoln Cottage, just outside of downtown Washington, three miles from The White House. This summer home for the Lincolns from 1862-1864 opened in 2008 after a $15 million dollar preservation effort. Washington was built on a swamp, and as a result, the summer heat and humidity was especially oppressive. The Lincolns wanted to escape oppression of the heat and the numerous office seekers hounding the President. But they had another more personal reason to escape to the house at the Soldiers Home: they were still mourning the loss of their son Willie. President Lincoln would ride 40 minutes each day back and forth to the house--unescorted--down what is today Georgia Avenue. He survived an assassination attempt on that route in the summer of 1864. Before John Wilkes Booth's shots at Ford's Theater. Booth himself designed a plot where he would kidnap the President during his commute, but never carried it to fruitition. The Cottage was built on property that also held a retirement home for injured veterans of American wars. During his visits, Lincoln could see the Civil War's toll each day as men were buried on the adjoining grounds. He and Mrs. Lincoln would visit injured soldiers in nearby hospitals. But it was also here in 1862 that he wrote the final draft of the Emancipation Proclamation. On January 1, 1863, those slaves became free. If you visit, advance tickets are recommended, and parking is available on the grounds. The cottage is located, not far from Grant Circle, at Rock Creek Church Road & Upshur Streets, NW. After two years and $85 million, the National Museum of American History re-opens next month. The centerpiece of the renovation will be the 30 x 34-foot flag Francis Scott Key saw after the assault on Ft. McHenry on September 14, 1814 that inspired him to write the Star Spangled Banner. A five-story sky lit atrium now will greet visitors as they enter, and walls on the second and third floors have been removed to improve visibility. The flag will be displayed behind floor-to-ceiling glass on a slight angle to reduce stress on the wool and cotton fabric, and the first stanza of Key's poem will appear above and behind it. The light in the new gallery will be adjusted to avoid further deterioration and replicate Key's view of the flag in Baltimore Harbor from the H.M.S. Tonnant, which had appeared at the Battle of Trafalgar nine years earlier. Smithsonian officials finished cleaning the flag in 2005 after six years (this is not a misprint), where the old linen backing was removed, the flag was vacuumed and a new backing was put on. The museum will also display an original copy of the Gettysburg Address until January 2009. On loan from The White House, it is one of the few known copies of the address written by Abraham Linoln. The renovated museum will house artifacts ranging from the desk used by Thomas Jefferson to write the Declaration of Independence, to the shoes Judy Garland wore in the Wizard of Oz, to a DNA fermenter that played a key role in biotechnology. The idea for a museum of American history originated in the 1930s but took shape as World War II veterans returned home after seeing the great European museums. Built in 1964 with the same Tennesse pink marble as its neighbor, the West Building of National Gallery of Art, the museum was built in the international modern style. Artifacts like the Star Spangled Banner had been displayed in the Arts & Industries building across the Mall. We'll keep you posted as the museum re-opens. Addendum March 12, 2009: We viewed the restored American flag recently and were impressed. The display is arranged somewhat like the Constitution and Declaration of Independence at the national Archives, a few doors down on Pennsylvania Avenue. Visitors walk into a darkened gallery with interpretive signs along the walls. As you continue through, the low-light display of the flag spreads out before you. The exhibit tells the story of Mary Pickersgill, a Baltimore flag maker who was hired to sew the flag that would fly over Ft. McHenry during the British bombardment. Pickersgill had made flags for various military and maritime organizations, but was asked by George Armistead, Commander of Ft. McHenry, to make a 30 x 42-foot flag with 15 stars and 15 stripes that quickly outgrew her house. Armistead said he wanted a flag so large that the British would have no problem seeing it from a distance. They didn't, and neither did Francis Scott Key.